Update 1/27/17 – Jobs like this go fast, and this one has, too. But don’t despair, we post new work from home jobs every day on our Daily Jobs page. Good luck! 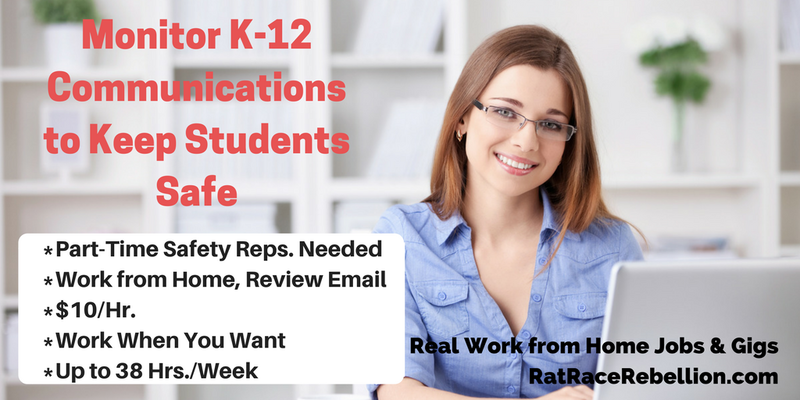 Gaggle monitors K-12 student email and other communications for cyberbullying, threats of violence, drug use and other content of concern to schools and parents. Gaggle hires people working from home — Safety Representatives – to do the monitoring. Requirements include experience with social media and internet culture, a love of reading, and an awareness of the slang used by children and teenagers. Gaggle currently provides safe student communication tools to more than 15,000 schools. It manages over 2 million accounts and stores more than 750 million emails. Workflow can vary, says the company, and it can’t guarantee a length of time for the job. “We will do our best to make sure you are aware of possible lulls in available work as well as when we might expect a surge in items to review,” the company adds. Employee reviews give Gaggle 3.9 stars out of five. To go straight to the job, click here. For more on the company, click here. Good luck! This entry was posted in Work at Home Jobs and tagged Gaggle. Bookmark the permalink.